As I wrote in one of my earlier posts about Romanian Kosher sausage, it is the kind of place you forget about for a while, then one day you wander in there and wonder why the heck you have been away so long. It doesn't matter how long it has been since your last visit, there it is, exactly the same as when you left it. It is definitely one of Chicago's rapidly dwindling "time-warp" establishments. In fact, you get the feeling that the place hasn't changed an iota in the 47 years that it has been operating at it's present location in Rogers Park. Opened, 55 years ago, by the Loeb Family in Albany Park in 1957, RKS is a business that relies entirely on its reputation. Looking around the place, you notice the distinct lack of fancy displays or marketing gimmicks, all you see is what "The Romanian" is known for... its glorious meat. From the beautifully marbled skirt steaks to the smokey little beer sausages, you are surrounded by what makes RKS a favorite institution among Chicagoans. Everybody has their favorite Romanian treat whether it is the perfectly spiced Garlic Polish Dogs or the Medium Hard Salami, or the beloved Kishke, there is always one thing that each of Romanian's loyal customers will tell you is "the best in the City". Surprisingly, my personal favorite is not a meat product at all, but the wonderful Shabbat potato salad made every Thursday especially for the upcoming Saturday's family meal (although mine rarely lasts past lunch on Friday). The great thing is you don't have to keep Kosher to love the Romanian, you do not even have to be Jewish. My father was Irish, and just adored the corned beef. 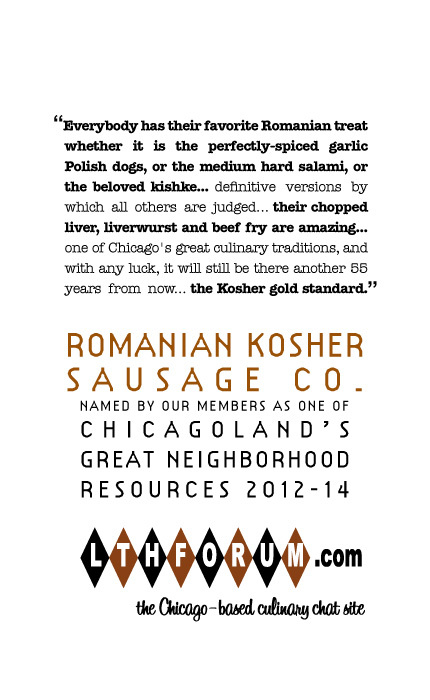 Anyhow, I don't know what to write to convince people that Romanian Kosher Sausage is one of Chicago's "Great Neighborhood Resources". To me it is one of those "no-brainers", and to any of their customers, I am sure it is the same. If you are not one of their customers, then you should be. I swear, go there once, and you will feel like you have been a customer for 50 years. If you are already a fan of RKS, then I am "preaching to the choir". If not, take a moment and read what others have said about the place (a simple search renders 6 pages of references). Better yet, stop in there and experience shopping with the personal touch that your parents and grandparents knew. It is truly one of Chicago's great culinary traditions, and with any luck, it will still be there another 55 years from now, but just in case, stop in soon. Last edited by d4v3 on March 7th, 2012, 5:34 am, edited 1 time in total. To me, this is a great nomination because, now that it's been made, it's so obvious . . . but it isn't one I'd thought about before the nomination was made. Distinctive, great-quality stuff to be sure. My only knock, and it's a minor one, is the skinless hotdogs and polishes. Yes, I understand why that has to be and also that it's a textbook nitpick. If it weren't for that small detail, this place would be entirely perfect. Still, this is easily a GNR in my book. I moved to Chicago 25 years and keeping kosher I asked where could I go for kosher meat and deli without hesitation everyone send go to Romanian - I have been doing that now for 25 years and all the items already mentioned are phenomenal and to add their chopped liver, liverwurst and Beef Fry are amazing - only downside of nominating this gem is perhaps they will become even more crowded than they are now! And to add - their sandwiches are a steal - a corned beef sandwich for 5.99 iis a BARGAIN! I love their salami, pastrami, sandwiches, and hot dogs. Plus, my great-grandfather bought sausages there years ago. So this is a special place for me on several levels. Great nomination, d4v3. No question about it. I share the quibble about the skinless dogs and polish, but that's not why I go there. It should be on all meat lovers' go-to lists. Funny how many intestine chewers there are around here. I like me some G&J rubber dogs too, but for sheer flavor, I would take a Romanian Spicy Polish over any other dog made, with or without skin. Admittedly, skin would make them better, but you can't beat the flavor of their dogs, especially in the all-beef category. About 80 of the skinless beauties (of both varieties) were happily consumed at one of the early LTH picnics. ronnie_suburban wrote: My only knock, and it's a minor one, is the skinless hotdogs and polishes. I interviewed their manager last year, and he said he'd been experimenting with newly available glatt kosher casings, but their machines shredded them. He didn't seem convinced there was a big enough market for natural casing kosher sausages to make it worth the trouble to keep trying. I suggest that everyone who shops there start asking about them whenever you go, and perhaps that will convince him to work on it. AFAIK, there are no natural-casing kosher hot dogs made in the U.S. Here's a sweet little video on this Rogers Park fixture. Love the comment about the customer service!